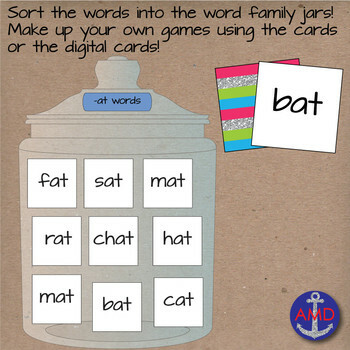 This learning center is designed to help students recognize ending sounds and decode word families. 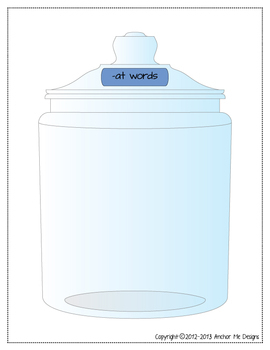 It will help students gain phonological awareness and boost their confidence in word work! RF.1.2 Demonstrate understanding of spoken words, syllables, and sounds (phonemes). RF.1.3 Know and apply grade-level phonics and word analysis skills in decoding words. RF.2.3 Know and apply grade-level phonics and word analysis skills in decoding words. 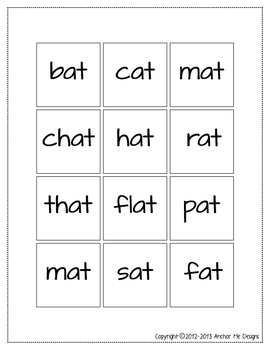 SWBAT identify ending sounds and rhyming ending sounds. SWBAT decode common word families. Your kids will LOVE this hands-on center! It is very easy to modify to meet the needs of your students. 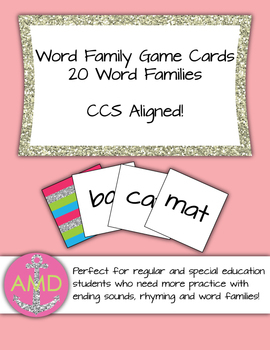 They will love that it's easy to make up games using the word family cards and images for the Smartboard. All of the graphics are original and were made by Anchor Me Designs and are high quality 300 dpi PNG files. I LOVE READING YOUR FEEDBACK!! All comments and ratings are welcomed and appreciated! Rate and follow me for a coupon code! Just send me an email showing your user name and receipt to AnchorMeDesigns@gmail.com! Visit my website AnchorMeDesigns.com for more fun freebies!